For my birthday weekend, my parents and I decided to drive up to Asheville, NC and spend some time in this charming town. Asheville has a population of approximately 87,000 people, nestled between the Blue Ridge Mountains and Great Smoky Mountains, and is known for its arts, the great outdoors, and of course, incredible cuisine. For this particular evening, we narrowed our choice to Rhubarb based on their availability for seating for three between the prime dinner hours of 6PM to 8PM. 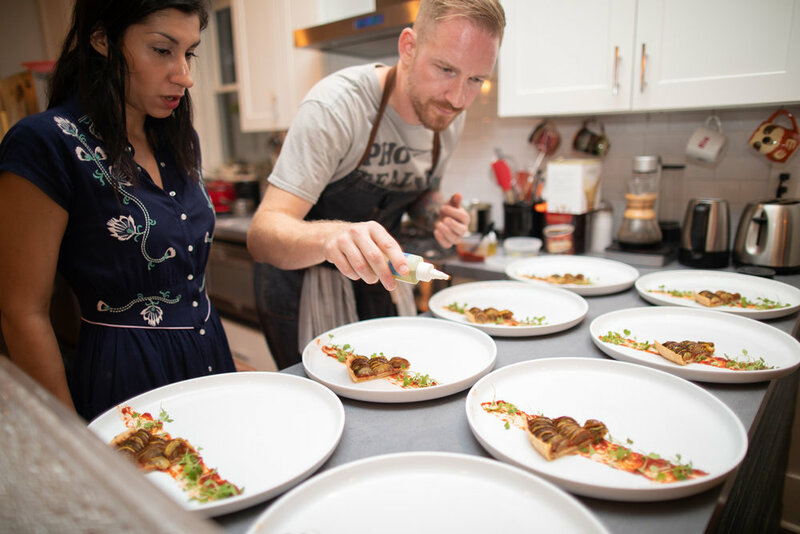 The James Beard Foundation highlighted the owner/chef of Rhubarb, John Fleer, as a Rising Star of the 21st Century. Additionally, John Fleer received a finalist spot for James Beard Best Chef in the Southeast on several occasions. 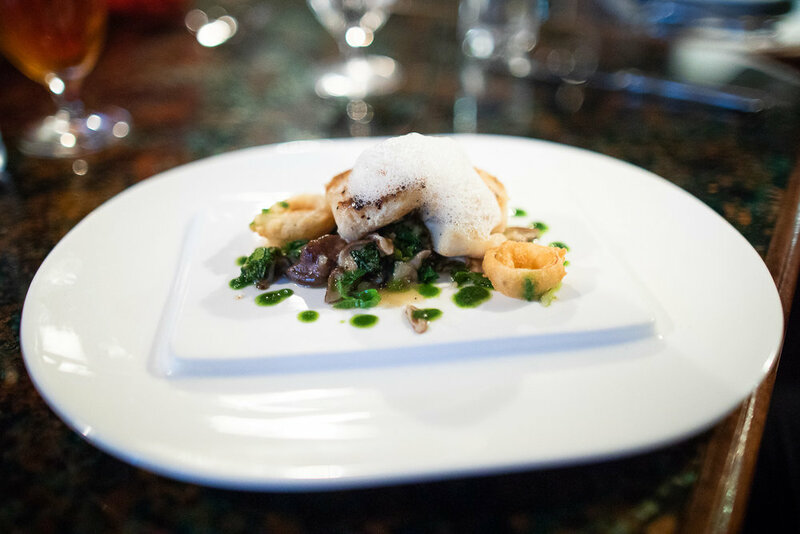 However, you don’t have to be aware of the chef’s accolades to enjoy a wonderful meal at Rhubarb. The location of Rhubarb is at 7 SW Pack Square, although if you are looking at a zoomed-out map of Asheville, it’s located a few feet away from the very busy Asheville Avenue and Patton Avenue intersection. Rhubarb is nestled in this little square, just to the left of the large tree at the center of frame near the Biltmore Avenue and Patton Avenue intersection. If you pay attention to the details, both on the exterior and interior of Rhubarb, you will notice the incorporation of natural elements (such as wood and flowers) and the rustic ambiance. Front entrance to Rhubarb. (It is Instagram-post worthy). 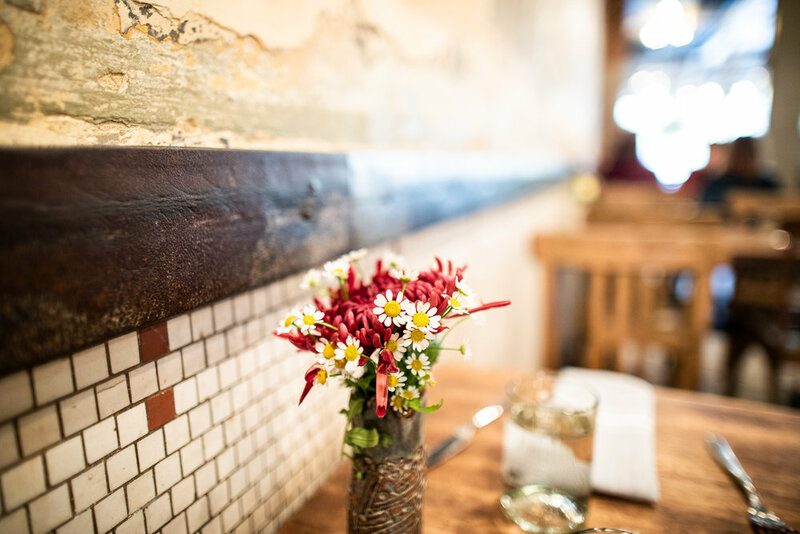 The fresh bouquet of daisies at the table at Rhubarb were a pleasant sight. The “Passing Time” menu portion at Rhubarb. We decided to try out the barbecued lamb ribs and the seared royal red shrimp from the “Passing Time” section of the menu for our appetizers. The barbecued lamb ribs at Rhubarb. The seared royal red shrimp at Rhubarb. The lamb ribs were very tender with a slightly sweet barbecue sauce. They were absolutely delicious and could serve as one’s main course. The shrimp were delicate, and the cashew butter was an amazing touch to the shrimp. 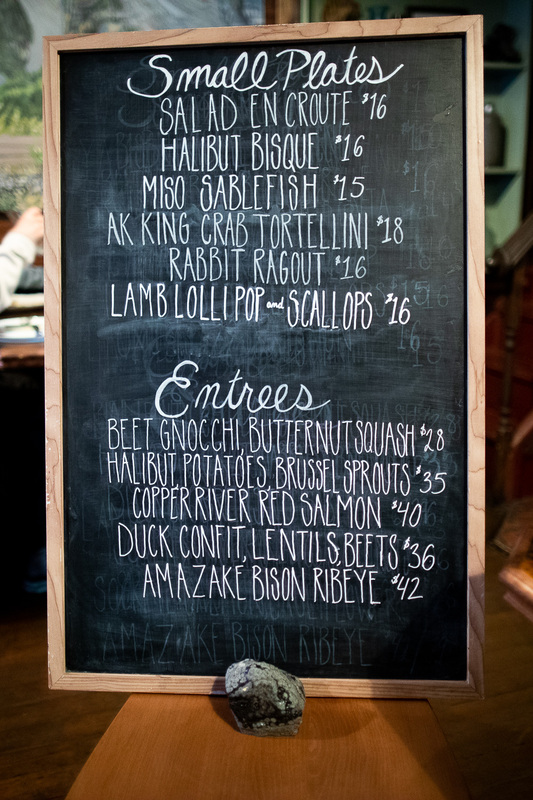 From the main course menu, we decided to order the wood-roasted whole sunburst trout, wood-grilled BCF bavette steak, and the quail (which isn’t seen in the menu screenshot below). The “Full Plates” section of the menu at Rhubarb. The wood-roasted whole sunburst trout arrives to our table. The server kindly asked whether we would like to have the trout cleaned for bone removal, to which we agreed. A few snaps from this de-boning (which was riveting in its own right) are below. (I commented this procedure shares a fine balance between an art and a science). Near the beginning of the de-boning operation at Rhubarb. Servicing (de-boning) the trout at the table at Rhubarb. Removal of the backbone from the trout. The trout ready to eat. The quail was beautifully presented and the raspberry sauce on the side was delicious. 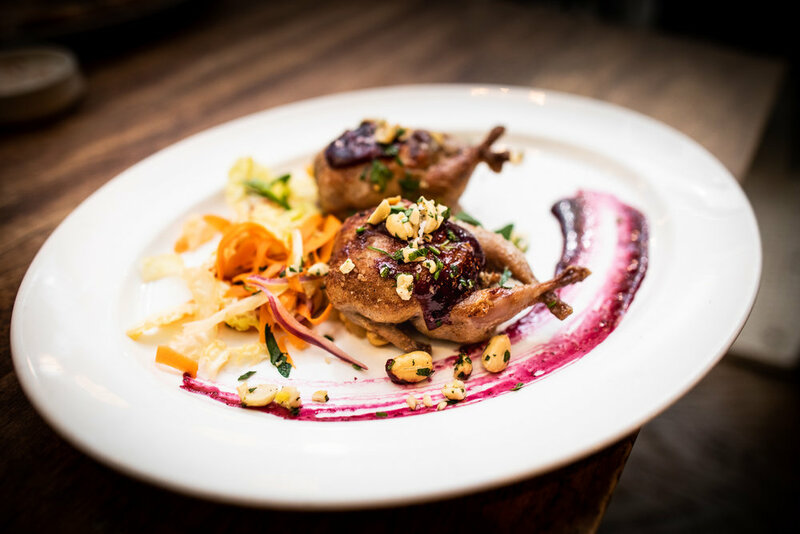 The quail from the rotating dinner menu at Rhubarb. Inside the main dining room at Rhubarb. 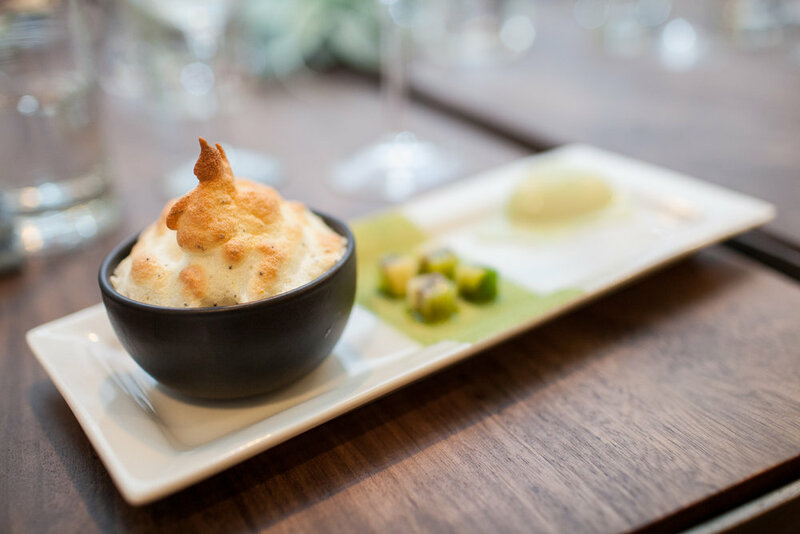 Overall, Rhubarb was a five-star experience all-around: food, service, and ambiance were incredible. I definitely recommend trying out Rhubarb if you’re ever in Asheville, NC. Rhubarb is located in downtown Asheville, NC at 7 SW Pack Square. Reservations are highly recommended for dinner, although Rhubarb has some tables open for walk-in customers during prime hours. 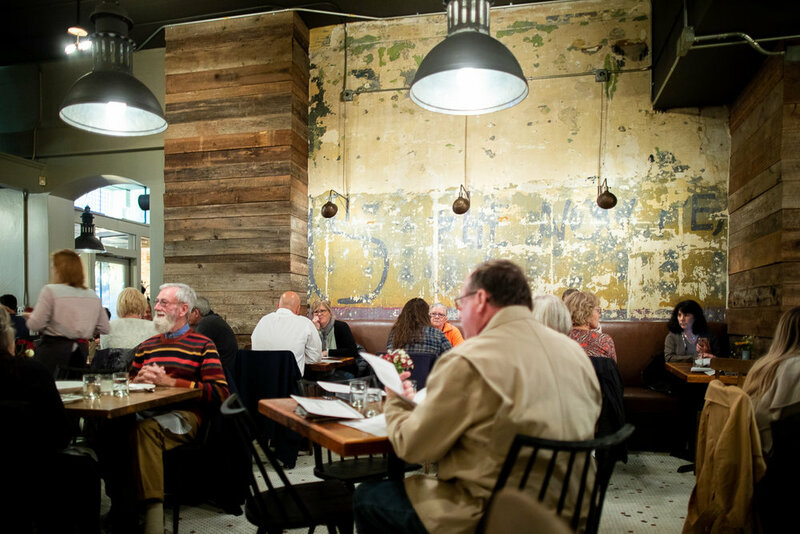 Each Sunday at 6:30 we serve a three-course meal at the communal tables. The Sunday Supper menu is different from the regular restaurant menu and reflects the bounty of the weekend markets presented family style. Also, a local guest farmer hosts our weekly convivial community tables. It’s not just “farm to table”, it’s “Farmer to Table”. 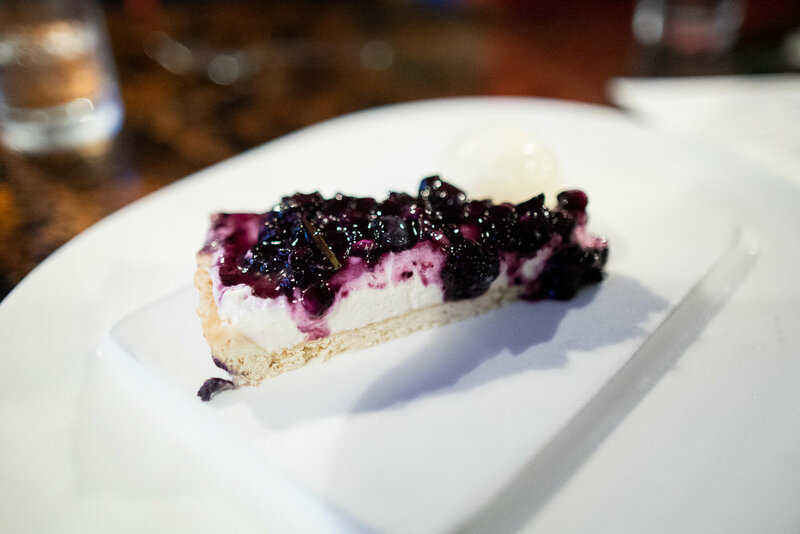 We start with a selection of snacks to pass, proceed to an entrée with several accompaniments served family style and finish with dessert. The supper table is a universal opportunity for people who may or may not know each other to reflect on the day and on their shared experiences. Maybe children and restaurants don’t always mix perfectly, but the table is where kids learn to talk, listen, share, and become a part of a community. Families and communities, however you define them, harmonize naturally at the dinner table, at a restaurant or in the home. That’s how I hope everyone will experience Sunday Supper. A long line of patrons waiting to get seated at Rhubarb for dinner. Last weekend, I attended a GrantMeFood dinner with the theme of 1912 Paris. It was my second GrantMeFood dinner (I blogged about my first experience here), and it was, again, fantastic. Chef Grant and his wife Ria made everyone feel welcome and did an amazing job preparing, cooking, plating, and hosting. Some photos I captured at this dinner are below. Ria serving the beef tenderloin with dill crème fraîche, horseradish, capers & zest. Detail of the beef tenderloin. Ria serving the summer vegetable tarte (a play on ratatouille) with eggplant, zucchini, squash, roquefort, truffle, tarragon & red pepper pureé. 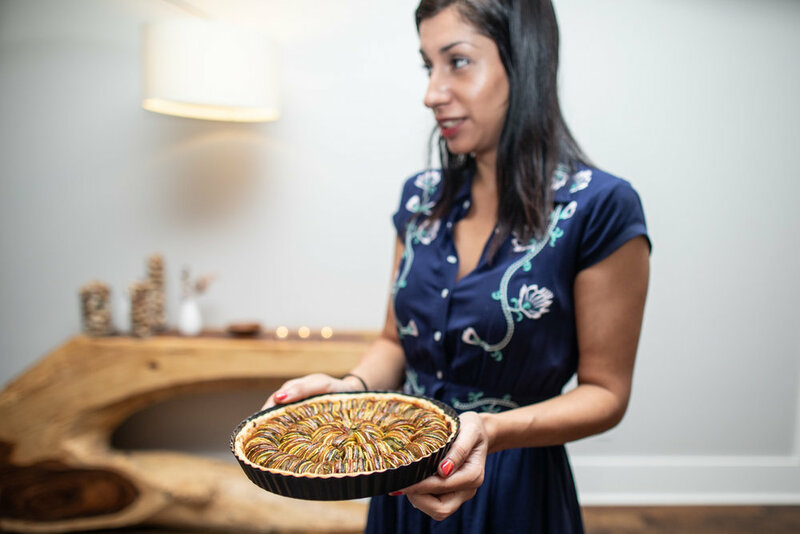 Ria serving the summer vegetable tarte. Detail of the summer vegetable tarte. So yummy! Grant and Ria plating the tarte. The tarte is ready to be served. Another angle of the vegetable tarte. 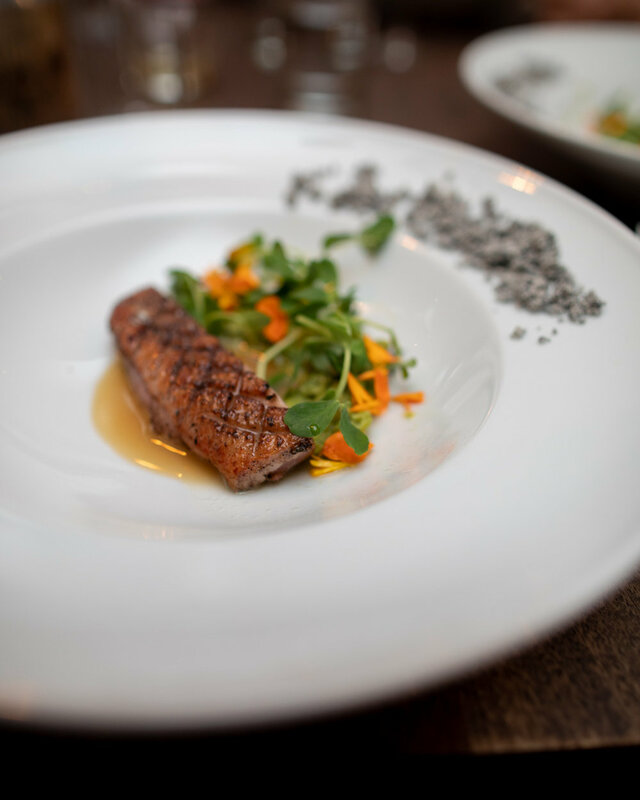 Serving of the duck (72 hour prep) with caramelized onion broth, field pea & mint pistou, earl grey ash, and pea shoots. Another view of the final serving of the duck. The duck was the star of the evening. Getting ready to put the chocolate soufflé into the oven. Chocolate soufflé out of the oven. Grant and Ria putting the final touches on the chocolate soufflé. 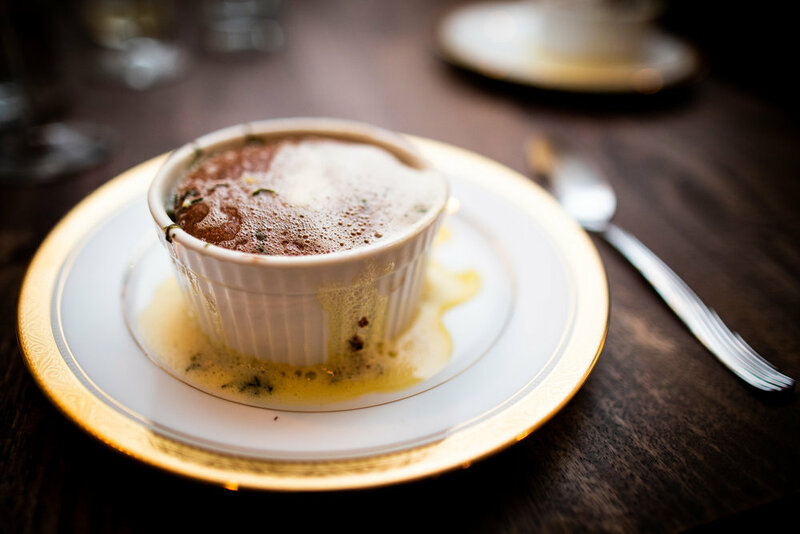 Chocolate soufflé with basil sabayon ready to eat. If you are interested in tasting incredible food in a warm, friendly atmosphere (and don't mind the serendipity that's involved with interacting with other strangers/like-minded foodies around Atlanta), I highly suggest checking out the GrantMeFood website and signing up for his mailing list (some dinners sell out very quickly as there are only eight spots at the table), following the @GrantMeFood Instagram account, and liking/following the page on Facebook. Something that I am trying to get more involved in this year is exploring the food/restaurant scene in the Atlanta area. 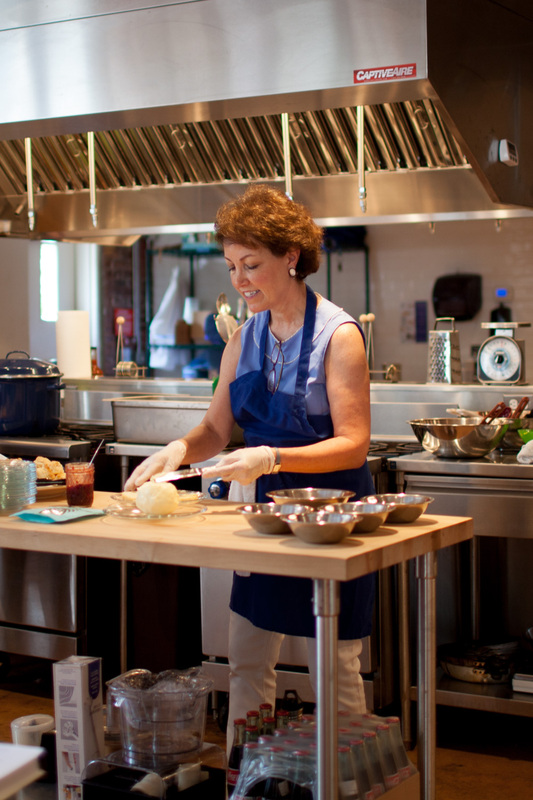 Yesterday, I had the pleasure of attending Cathy Barrow's presentation at Preserving Place, where Cathy taught the audience how to preserve a selection of foods. Cathy Barrow, also known as Mrs. Wheelbarrow, is the author of Mrs. Wheelbarrow's Practical Pantry: Recipes and Techniques for Year-Round Preserving. The book was available for purchase at the event, and a large number of folks in attendance stayed until the end to get their book signed by Mrs. Wheelbarrow. 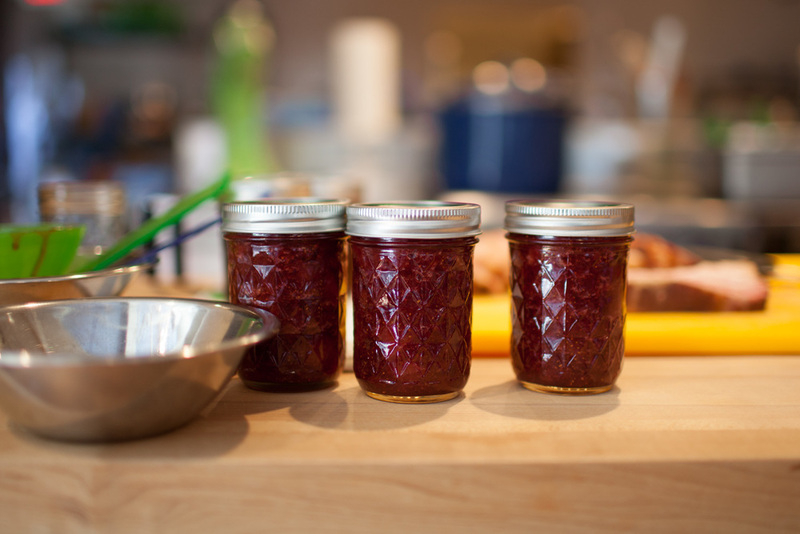 The three main highlights of the event were learning how to make/preserve jam, bacon, and home-made butter. Something I learned that I hadn't known previously: you can make homemade butter by using heavy cream and spinning it in a mixer until it solidifies. Mrs. Wheelbarrow was very helpful in answering the many questions coming from the audience. One of the best questions asked was during a preparation of preserving pork belly: "Did you bring that with you on the plane?" To which Mrs. Barrow delightfully responded: "No, I don't fly with pork belly. I have to draw the line somewhere." Everyone burst out laughing, and it was a wonderful moment. Below are some photos which I captured at the event. Mrs. Wheelbarrow is wearing a white apron with blue flowers, and the owner of Preserving Place, Martha McMillin, is dressed in a solid blue apron. 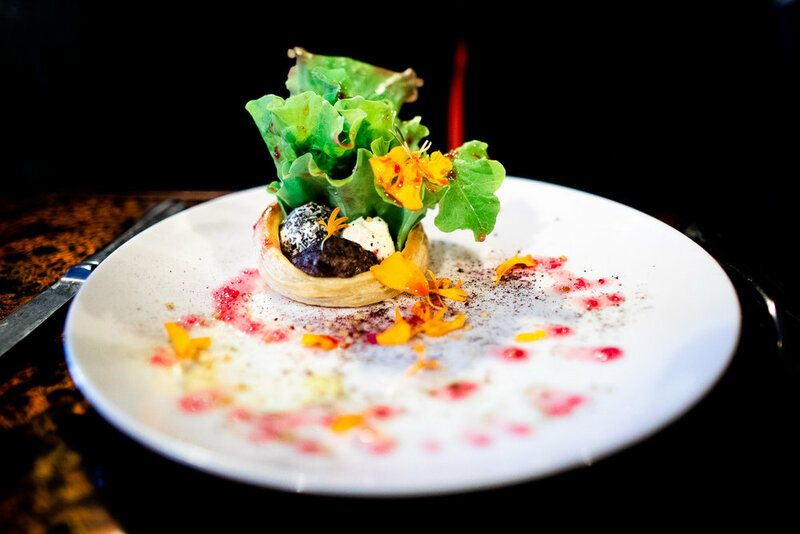 If you're interested in learning more or perhaps taking a class about preserving food in the future, Preserving Place has a great lineup of future events on this page. I highly recommend it.